June 2009 – King James Only? My story is short. I’m not sure about short and sweet, but it is short. I was raised in the southern part of the USA, “away down south in Dixie.” My raising was in a Christian home. We were Baptists, and I remain a Baptist. Our particular group of Baptists is a group that is very exclusive and somewhat anti-intellectual. In fact, much more so that most IFB’s with which I’m acquainted. We were also KJVO. The funny thing is that there never were any reasons given for our being KJVO. I was eighteen years of age when I heard my first argument in favor of KJVO. It was just assumed that we were that, and no mention was made of it in an effort to defend it. As time went on I felt the “need” to defend KJVO’ism. Thus I found “Let’s Weigh The Evidence.” Later I found David Cloud. I must say that David Cloud’s ministry has many good points. Though I do not know him personally, I have corresponded with him some and found him to be a generous person. It was through his generosity that I got a couple of his books, though I could not afford them. His KJVO books in my library are extensively underlined. I had found someone who could give a reasoned defense of the King James Version Only position. There was a problem, however. I simply could not find myself declaring holy men who loved Jesus heretics even if they did use other translations of the Scriptures. I could not line up with what were sometimes very extreme and harsh attitudes toward those who used translations other than the KJV. If one loved the Scriptures it would seem that they would love their brothers in Christ. That did not seem to be the case, though, among the KJVO people. They seemed to be very divisive. As time went on, I could not find it logical to take the all or nothing position of the KJVO position. After all, suppose that there were errors in other versions. Why should that mean that they were totally bad? The Word of God is God’s Word wherever it is. It is God’s Word even if there are mistakes in places. Of course, I’m not speaking of the inerrancy issue, but translation issues and issues concerning textual variants. That led me to lean toward a Textus Receptus Only position, then to a King James Preferred position. As a matter of fact, I still prefer the King James Version for several different reasons that I may present in the future. Finally, a few weeks ago I read “The King James Only Controversy” which led me to realize that the “scholarly” arguments in favor of KJVO’ism were flawed. So, here I am today, loving my KJV, but referring to other translations, and finding myself feeling a little more free in Christ. Philip Comfort’s New Testament Text and Translation Commentary is a valuable resource for studying the textual variants in any given NT passage. The book lays all the evidence out in a helpful format for which Greek manuscripts or early translations support which reading in almost every place where the text of today’s English Bibles differ with one another. He not only shows which Greek manuscripts and text use which reading, he also shows which major English Bible versions use which reading (whether in the margin, footnote or text of the Bible). After listing the evidence, Comfort will then walk you through it helpfully. He explains what factors such as a particular scribe’s tendencies or the nature of a specific manuscript influence him to favor the reading he supports. Having Comfort as a guide is valuable, especially since he is intimately familiar with the all the NT papyrii and many other points of textual criticism. Comfort is no disbelieving scholar, either. He is very evangelical and at times shows evidence of being conservative. Above all, Comfort has provided an invaluable reference tool for use by those intrigued by the differences between English Bibles, and especially for those who aim to think through the KJV Only issue in depth. What’s great is that he does all this with the average English speaker in view, he always translates the Greek he cites and the entire tool is usable by those with no Greek knowledge at all. The book includes an overview of both textual criticism and its history, as well as the current state of the manuscript witnesses we have for each section of the New Testament. Even the most well-versed student of these matters has much to learn from this work. For instance, Comfort offers all the evidence surrounding the story of the woman caught in adultery that is missing from many key Greek manuscripts (John 7:53-8:11). He shows why it is likely the reading was first introduced into the Greek manuscript witness in the 5th or 6th century. Yet he offers proof for the reading’s antiquity as well, theorizing that it may have been a legitimate story of Christ handed down that eventually was added to a collection of the Gospels by a well-meaning scribe. There is much more that could be said of this work, in fact I did say more about it when I reviewed it on my main blog. I wish it highlighted the readings of the printed Majority texts of Robinson-Pierpont or Hodges-Farstad when examining the evidence, but it doesn’t. Still, a more helpful resource for researching out the King James Only issue could hardly be found. When one comes face to face with the reality of the textual facts, the story of the King James Only position is seen for the wishful thinking it really is. David Cloud of Way of Life Literature republished a 2006 article he had written on the topic of Bible versions entitled, “Biblical Presuppositions on the Bible Version Issue.” His apparent goal is to show how his King James Onlyism is supported by simple presuppositions arising from the scriptures, and contrary positions are not. Obviously, I disagree. I appreciate David Cloud’s zeal. I used to be an avid fan of his and I am not seeking to do any personal harm. I simply would like to answer this article, for I feel it is misleading. The evolutionist would have me put aside my biblical presuppositions when I study the natural record and the textual critic would have me put them aside when I study the manuscript record, but I will not put biblical presuppositions aside for any reason. Though Cloud and his kind reject sweeping generalizations from the other side in which he and others are lumped together with the likes of Peter Ruckman and Gail Riplinger, he seems to have no problem returning the favor. Not every text critic takes things as far as Bart Ehrman; not every text critic takes things as far as Bruce Metzger; in fact, not every text critic takes things as far as Daniel Wallace. Most importantly, not everyone who rejects the doctrine of King James Onlyism is automatically a text critic. But Cloud’s article is set up as if those who reject his exclusive-allegiance-to-one-revision-of-one-edition-of-one-seventh-century-Anglican-translation-of-the-Bible-into-Elizabethan-English are, by default, checking their biblical presuppositions at the door – a view that I and many others who hold to my position reject. So much for fair representation, for I agree whole-heartedly with Cloud’s statement, “I will not put biblical presuppositions aside for any reason” even though I strongly disagree with his conclusion. 1. I BELIEVE IN THE SUFFICIENCY OF SCRIPTURE (2 Tim. 3:16-17). I agree with this doctrine. I believe Christ taught it (Matthew 4:1-4; 15:1-9; John 8:26-28; 14:10; Luke 16:27-31). As a non-King James onlyist, this presupposition does not have to be abandoned to hold to my position. Thus, it is evident that the child of God can make his own decision in the important matter of the Bible text-version issue. I do not ask my readers to depend on me and to follow my teaching; I ask them simply to prove all things and hold fast that which is good and to receive my teaching with all readiness of mind and to search the Scriptures daily whether these things are so. I claim that my adherence to individual soul liberty makes me a great opponent of King James Onlyism than David Cloud adherence to the same is a cause for his acceptance of KJVO. 3. I BELIEVE IN THE SIMPLICITY OF SOUND DOCTRINE (Mat. 11:25; 1 Cor. 1:26-29; 2 Cor. 11:3; 1 Jn. 2:20). Again, I agree with the above statement. I cannot agree where Cloud is going with it, however, which is that accepting modern versions is less simple than the doctrine of King James Onlyism. Simply put, King James onlyism is not a “simple” doctrine. The Bible version issue as a whole is not that simple, for a large portion of it deals with extra-biblical date. No where in the scriptures does God tell us which Bible, which family of manuscripts, or which text would bear His signature. To assert that maintaining a King James Only position is in accordance with “the simplicity of sound doctrine” is absurd. Dave Hunt is a man who has publically admitted that he knows very little about the Reformers and their writings. If you read Hunt (as I used to do regularly, as a follower of his), you will soon come to the conclusion that he does not understand Calvinism. One can be an intelligent believer but that doesn’t necessitate a sufficient understanding of every issue under the sun. Just take a look at Debating Calvinism written by both Hunt and White and you will see that Dave Hunt lacks a proper understanding of Reformed theology (I also believe Cloud is guilty of the same). Back to the main issue, Cloud then complains that textual criticism forces lay people to be subject to text critics in a way similar to Catholics and their priests. This ignores two things: 1) the King James only layperson is still subject to Byzantine monks, Erasmus and editors of the Textus Receptus, the King James translators, and the “scholars” on the KJVO side of things propagating their extra-biblical reasons for using only the King James Version, and 2) not every Christian who does not hold to King James onlyism is automatically engaged in textual-critical studies. The former is significant, because Cloud then gives textual-critical terminology and an example from A.T. Robertson to show just how “confusing” this issue can really be. Are we to believe that, in order to arrive at a King James Only view, one is not going to examine things like the origin of ancient manuscripts, the men behind text editions, the transmission of the text, textual variation, and the like? I agree with the presupposition concerning simplicity. But I do not believe every wind of theology is simple. Simple things exists and deep things exist. God can be known, yet His ways are past finding out. Our faith in the Word of God is simple. But that does not mean that the 2,000 year old issue of Bible versions and translations is as simple. 4. I BELIEVE THAT ALL THINGS SHOULD BE DONE UNTO EDIFYING (Rom. 14:19; 1 Cor. 14:26; 2 Cor. 12:19; Eph. 4:12, 16, 29). I endorse this presupposition, with the understanding that at times certain actions do not edify immediately but have the goal of edifying in the end. One such example would be church discipline. Another, perhaps more significant in this discussion, would be the “ministry of warning” to which brother Cloud believes he has been called. His refutations of hundreds, if not thousands of fellow believers over the years have not all been edifying. Yet, I’m sure he would say that, in the end, he is warning Christians so that they will in fact be edified. I would agree, of course, because false teachers and false teaching exists. “Best of all, the book is spiritually edifying. That is especially refreshing, because much written on the subject is anything but edifying.” I guess it all depends on how one looks at things. Finally, if Cloud’s intention is to say that simple works like theological journals and textual apparatuses are not edifying because they are too technical and do not cause any Christian growth, then I would assume he is also against Christian research magazines, archaeological reviews, 1st century cultural studies, and other technical analyses that shed more light on our Faith. 5. I BELIEVE IN THE REALITY OF THE DEVIL (1 Pet. 5:8). Again, I also believe in this presupposition. The devil is very real. But Cloud repeats the same charge, that Satan’s questioning of God’s Word in the garden is somehow related to textual variation found in the transmission of the text. That is a huge leap not warranted by the Bible. He makes another leap, that of tying together the acceptance of modern versions with questions like “did God really destroy the earth with a flood” and “did Moses really write the Pentateuch?” This ignores the great distinction between the two issues. 6. I BELIEVE IN THE PRE-EMINENCE OF FAITH (Heb. 11:6; Rom. 10:17; 14:23). I believe in the preeminence of faith as well, and my faith in God’s Word has not shrunk one iota since rejecting King James onlyism. Cloud, point, however, is to say that the King James only view is rooted in faith whereas the alternative view is not. He quotes a BJU author who criticized Wilbur Pickering’s Majority text position because it leaned heavily on a theological presupposition. What about the possibility that those presuppositions can be wrong? Certainly David Cloud is no majority text supporter. If he engaged in a debate with Pickering, the two would be using argumentation to support each’s own presupposition. I have faith that the evidence will always be in favor of Christianity, just as I have faith that geological and biological evidence will always support Creation. I am not afraid of the data. I also see that Jesus and the apostles did not always quote directly from the same Old Testament text. I do not need commentaries or textual critics to see that, either; just a copy of the Old Testament and a copy of the New Testament. Yet, I have faith that in each case, it was God’s Word that was quoted. Contrary to Cloud’s assertion, a presupposition of faith does not necessitate King James onlyism. 7. I BELIEVE IN TREMBLING BEFORE GOD’S WORD (Psa. 138:2; Prov. 30:6; Isa. 66:2; Rev. 22:18-19). I too believe in trembling before God’s Word, not only in reading and listening to it, but in obeying it. A rejection of King James onlyism does not give me permission to play around with God’s words lightly. Just because many textual critics are liberal and unashamed doesn’t mean they all are. Just because some King James onlyists use English to correct that God-breathed Hebrews and Greek doesn’t mean all do. Sweeping generalizations do not help in either case. 8. I BELIEVE IN THE NECESSITY OF THE HOLY SPIRIT (1 Cor. 2:12-16; 1 Jn. 2:20, 27). Of course, I also believe in the necessity of the Holy Spirit. He guides us into all truth. But Cloud’s purpose of listing this presupposition is to say that all versions other than the King James are products of humanistic rationalism, while the King James is the only one the Holy Spirit has approved (which he is asserting, by default). While he lists some men on the critical text side, he doesn’t attempt to prove that Erasmus was guided by the Holy Spirit, or that Beza’s corrections were guided by the Holy Spirit, or the TR editions of the Elvizers or Stephanus were either. We aren’t told that the King James translators were guided by the Holy Spirit but we are left to assume to because the modern versions are definitely not. He quotes George Ladd as saying, “Textual critic George Ladd wrote: “One does not solve a problem of divergent textual readings by prayer or by the inner illumination of the Holy Spirit; but only by an extensive knowledge and skill in the science of textual criticism” While it is true that textual criticism is a science that tries to consistently choose the best readings based on certain evidences, who is to say that the Holy Spirit is not involved? What methods did Erasmus use and how do we know the Holy Spirit was involved then? David Cloud leaves us with nothing but assumptions. In conclusion, I agree with all eight of David Cloud’s biblical presuppositions: the sufficiency of scripture, the soul liberty of the believer, the simplicity of sound doctrine, all things being done for edifying, the reality of the devil, the preeminence of faith, trembling before God’s word, and the necessity of the Holy Spirit. Yet, I am not King James Only. Though much more can be written as to why I am not, an obvious gap must be highlighted. Though Cloud and his kind reject sweeping generalizations from the other side in which he and others are lumped together with the likes of Peter Ruckman and Gail Riplinger, he seems to have no problem returning the favor. Not every text critic takes things as far as Bart Ehrman; not every text critic takes things as far as Bruce Metzger; in fact, not every text critic takes things as far as Daniel Wallace. Most importantly, not everyone who rejects the doctrine of King James Onlyism is automatically a text critic. But Cloud’s article is set up as if those who reject his exclusive-allegiance-to-one-revision-of-one-edition-of-one-seventh-century-Anglican-translation-of-the-Bible-into-Elizabethan-English are, by default, checking their biblical presuppositions at the door – a view that I and many others who hold to my position reject. So much for fair representation, for I agree wholeheartedly with Cloud’s statement, “I will not put biblical presuppositions aside for any reason” even though I strongly disagree with his conclusion. YouTube Response: The NIV is a Jesuit Bible? On May 25, 2008, YouTube user icartoon2 posted a video titled KJB KJV Truth of Acts 15. It is a small clip of a presentation in which Seventh Day Adventist Walter J. Veith makes the claim that the NIV is a Jesuit Bible. Dead on the money. Very good word, I’m passing this one along. As I went through the video and noted some of the obvious flaws in reasoning, I thought a response might be in order. Veith supports his Jesuit Bible claim by repeating three arguments directly from Benjamin Wilkinson’s book The Authorized Version Vindicated. Brethren, if a man be overtaken in a fault, ye which are spiritual, restore such a one in the spirit of meekness; considering thyself, lest thou also be tempted. The inclusion of the quote from the Dublin Review is nothing short of ironic. It in no way supports the point that Veith is trying to make, and by not doing so, it weakens his case, as the DR author would most certainly have jumped on such an important difference as going from “mistakes” to “sins”. Instead, there is no question that the DR author understands “faults” to mean “sins”. If you look at the quote in the original source, two important points will quickly jump out at you. 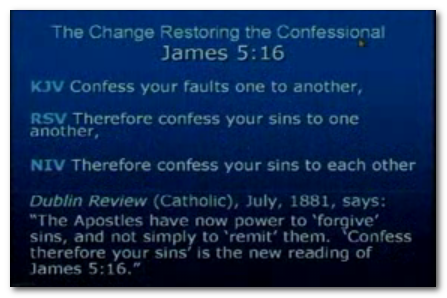 The Apostles have now power to “forgive” sins, and not simply to “remit” them. “Confess therefore [emphasis in the original] your sins” is the new reading of James v.16, and the banished particle has returned to bear witness against Protestant evasion. The next translation attacked by Veith is Hebrews 10:21. As is normally the case when differences between versions are attacked by KJVO proponents, no mention is made of the underlying text. 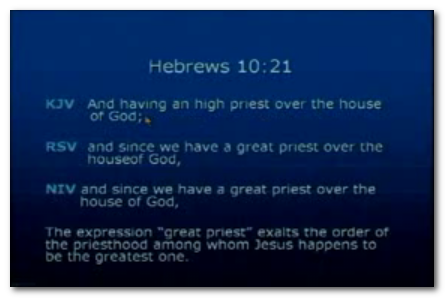 There is good reason for translating Hebrews 10:21 as “great priest”. It can easily be shown by looking back a few chapters at Hebrews 4:14 where we see the words in the KJV, “great high priest” (Greek: megas archiereus). Notice that megas is translated as “great” and archiereus as “high priest”. The words in question in Heb 10:21 are megas hiereus, literally “great priest”. It would seem that “great priest” would be the preferred rendering for people who normally claim to be very concerned with “word-for-word” translation. Whether “great” or “high” is the proper translation is not really the issue. The important question to ask is whether translating megas as “great” makes the NIV a “Jesuit Bible”, as Veith claims. To answer, let’s take a look at how the Catholic Douay Rheims Bible translates Hebrews 10:21. If we are going to apply KJVO reasoning, let’s do it consistently. It is the KJV rendering of megas that is the preferred Catholic wording. It is the KJV that is praised by the Dublin Review as being a Catholic-influenced Bible. Veith spends very little time on the actual text and differences of Acts 15:23, but uses it as a springboard to get into his rant on the priesthood of all believers. This is a clever, albeit misleading rhetorical technique. At this point of the YouTube video, the discussion comes to closely resemble a “shell game”, where Veith quickly shows Acts 15:23, then sticks it under a cup, shuffles a few cups around, then presents a different cup with a different topic of discussion as though it were the same one. At the end you are left thinking, “wow, the NIV doesn’t support the priesthood of believers!” In reality, Acts 15:23 has nothing to do with this doctrine, and as you have probably now guessed, it has certainly not been removed from the NIV. The unwarranted implication that Veith feels links the passages in Acts to 1 Peter is apparently that the idea of roles in the church are somehow related to our ability to approach God without a human mediator. This link is not supported by the KJV, NIV, nor RSV, so it’s not clear how he has jumped to this conclusion. On the other hand, even in the KJV there are distinct differences between roles and authority in the church. There’s not been a KJVO church I have ever been to that would have allowed a woman to preach (except maybe Gail Riplinger, who sometimes gets a free pass). 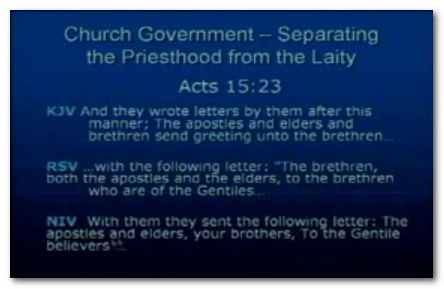 Does this mean they are not part of the “brethren”, or don’t have access to approach God without a human priest? As with Veith’s other two claims, this one can easily be flipped on its head. By clearly delineating the three different “classes” of apostles, elders, and brethren, it could be argued that it is actually the KJV that supports the clergy/laity division. In the KJV, the apostles and elders are set apart in their own category above that of the general masses, whereas in modern versions, everyone is included as brothers—all are equal, merely with different roles. The unsubstantiated accusations thrown at modern Bible versions and translators are really not helpful to the already complex, passionate Bible version debate. If King James Onlyists would measure their own preferred version with the same measurements they try to use on others, we could save ourselves a lot of time. Christians need to stop encouraging the production of these arguments by uncritically accepting the things that they hear at the seminars such as the one in this video and what they see on YouTube. One theory I have as to why many people hold to the King James Only view is due to a false notion that Christianity stands or falls on biblical inerrancy. Because many Christians seem to believe this is true, they have been convinced that the Bible has to be fully inerrant, not just in the originals, but down to the last tittle even in the modern translations. Since all modern translations have differences between each other, they cannot all be God’s perfect Word. Therefore, one has to be it, and this one is the King James Version of 1611. For more on this (and I do mean more) please check out my series, “Christ and the Scriptures” over at my blog. If a person believes that absolute inerrancy is essential to Christianity being true (a concept not taught in the Bible, but developed much later), then it is understandable why there is so much hysteria surrounding the Bible version issue, particularly from the King James Only camp. After all, if the Lordship and resurrection of Christ hinge on textual variants, why not believe and defend that there is one absolutely inerrant version, perfect in its inspiration, text, transmission, and translation? Perhaps this is why more moderate King James Onlyists (those of the non-Ruckmanite sort) never call into question one translation choice of the King James translators, even tough they claim their position is based on preservation of the original language texts, not the English language. They do whatever they can to defend every single reading (majority or secondary) and every single translation of the KJV. On the other side, modern version editors and defenders are not so careful to make mention of textual variants and different translations. The extent of that varies, of course. Conservatives point out these issues, but argue from the standpoint of inerrancy in the autographs. Liberals (and apostates) abound with theories as to why these issues in transmission exist, including the idea that the Bible is just a man-made book. And then there are many hybrids of these two schools of thought. Putting the liberal views aside, the question is, should Christians be aware of issues in the text? Or should those discussions be kept n the seminaries and theological journals? The King James Onlyist insists that to make mention of these things only causes utter confusion. If a pastor preaches through a section of scripture with a textual variant, he is not to cause doubt in the hearts of his sheep by saying something like, “the earliest and best manuscripts do not contain this passage.” Likewise, he is “questioning God’s word” is he says something akin to, “this could be better translated as. . .” Avoiding these kinds of things, says the King James Onlyist, guards the integrity of the Bible and helps keep the laymen from doubting the faith. Personally, I disagree. I think the above tactic is wrong and has done ultimately more damage than it realizes. It keeps people in ignorance. The fact is textual variants exist. Most modern versions use things like brackets and footnotes that let the reader know the standing of a particular passage in the text, or an alternate translation. If a preacher refuses to talk about this, that will cause confusion. The book will say something different then the man behind the pulpit. Now, King James Onlyists do not have this problem. So long as they stick to the KJV, no one in the church will have a Bible that calls into question a textual or translational choice. But how long can people be kept in such ignorance? This kind of thing is the express reason why Dan Brown and Bart Ehrman are so successful. Ehrman in particular capitalizes on such ignorance in his books, Misquoting Jesus and sdsds. With his tabloid-like questions of, “did you know that the story of the woman caught in adultery is not part of the original Bible?” and “ ?” there is no reason why his works do not cause such a stir, even amongst Christians. The one from whom this information was hid will undoubtedly think, “I never knew that!” And then what? I do not want to suggest he will end of an apostate like Ehrman, but how can one reconcile these issues with the proposition that Christianity stands or falls on biblical inerrancy? It has been coming for a long time, but now more than ever, scholars, professors, and church leaders must be sure to make known the issues in biblical criticism. I am not suggesting that every layman must be acquainted with all facets of textual criticism, but they must be aware that there are passages, like the woman caught in adultery, that may not be genuine. They must equally be aware of how none of this affects Christianity in a negative way. Obviously, the pericope de adultera is a sentimental passage with which no one wants to part. And I do not have the conclusive answer as to how to approach it, either. James White has suggested that new versions ought to have the guts to not include it in the New Testament at all. He is convinced that the evidence is decidedly against it. I, however, am not as conclusive, and feel that there are a few theories that may preserve this account for us, such as it being apostolic tradition based on a true story that was later included in the text. Whatever one’s view, I think it is imperative to at least mention this issue to the people in the audience. It must be done diplomatically and with a confidence in the scriptures, but it must be done. One may end up avoiding variants like these, or may end up preaching a sermon from them anyway – albeit with a disclaimer. My suggestion will not sit well with King James Onlyists. They saw it only causes confusion. I say it is honest. People need to understand that we are Christians because of Christ, not the inerrancy of the scriptures. Inerrancy comes later. If Christ be not risen, our faith is vain (). But what if the scriptures today are not inerrant like the originals? Is our faith in vain? The Bible doesn’t say. And how does this compare to our concept of evidence anyway? If ten witnesses are called to the stand, and one of them is not quite sure about what happened, he judge does not dismiss the entire case. No, he has more than enough evidence to make a decision! Likewise, we have more than enough evidence to validate our faith. It will take a little more than a textual variant to destroy it. The choice has to be made: either keep the people in the dark, so when they read Bart Ehrman they are absolutely stunned, or let them know the history of the Bible, holding nothing back, yet equipping them with the arguments necessary to defend the faith. Do you agree or disagree? Why or why not? And, if you agree, what do you think is the best way for church leaders to approach this subject with lay people? On the other side, modern version editors and defenders are not so careful in making mention of textual variants and different translations. The extent of that varies, of course. Conservatives point out these issues, but argue from the standpoint of inerrancy in the autographs. Liberals (and apostates) abound with theories as to why these issues in transmission exist, including the idea that the Bible is just a man-made book. And then there are many hybrids of these two schools of thought. Putting the liberal views aside, the question is, should Christians be aware of issues in the text? Or should those discussions be kept n the seminaries and theological journals?